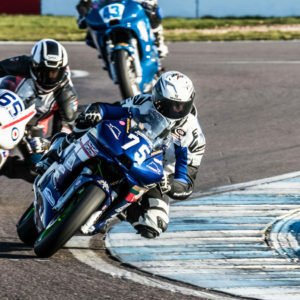 The Thundersport 500 event at Donnington Park was taking racing back to how it originated at club level, a single hectic day during the weekend. This race day, mainly featuring the CB500 endurance race, which was a show of how much fun you could have racing, without it costing its competitors the earth. This race would feature an old school Le mans style race start at the beginning of a 250mile race, with teams of up to 3 riders. 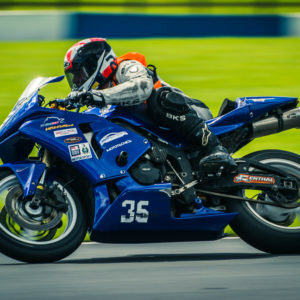 This would not only test the skill, but also physical and mental endurance of the riders, as well as the machine to keep up with the rest and at race speed for the best part of 3 hours. All the while trying to avoid extra penalties for mistakes made in the paddock, like trying to fix or even touch the bike while it’s being refuelled, or crashing the bike during racing. Aside from the 3 CB500 teams of 3 the RNRMRRT managed to pull together for this awesome one off event, the team also has to contend with 3 separate military races, where we would have to battle it out for points against the Army and the RAF on our normal bikes, making it a testing day for even the fittest and most experienced of the RNRMRRT. It was an early start for most of us, but luckily the weather was on side with a cold but clear blue sky above us as we headed down to the scrutinering bay, with our bikes, CB500s, in our teams and in full leathers at 0630. This was to getting everything checked and signed off as fit for racing, but we needed to get there as it opened to beat the stampede of everybody else that would be competing that day. Once given the all clear, it was back the garage, a luxury for this occasion, preparing the bike for the first outing of the day, testing at 0930, where riders would get to warm themselves in to the track for the day. So tyre warmers on, monitor tyre pressures and check fuel, plus any other last minute checks for peace of mind with your machine if nothing else. Then with any spare time after coffee and breakfast, put tactics and ideas together of how the endurance race would be conducted within each team. On a day’s racing the tempo really never does stop. At about 0900 the tannoy became alive with Bernadette organising the paddock, to the strict programme of the day, and before you knew it we were out on track, and from the off the pace was quick. After testing was qualifying for our grid position, firstly on Charlie Whites CB500, that myself and Max Wilmot had never ridden before, straight away we hit snags, but after moments of frustration by all of our 3 man team the fuel filter was changed and it was solely up to Max to get us qualified on the grid, which considering it was his first time on the machine wasn’t easy but we managed at 41/43, least the only was way up from here. The other 2teams doing well and getting 32nd and 33rd, but looking at some of the names within our rival teams it would be a tough race. Ron Haslam himself out of retirement, being a favourite to win, as well as a scattering of professional BSB riders who felt the day was just too good to miss. We then with half hour or so to relax before our military qualifying at 1106, the rivalry and banter between the RN, Army and RAF was in full flow, just from mini track battles in testing, so when we were called to the track, the pace was fast from the start with all riders improving lap by lap. Unfortunately for one RN rider, Allan Curtis who crashed out at Redgate who then couldn’t make the first military race due to crash damage, all were pleased with their times. At 1210 the first military race was on the grid taking their start positions, the adrenalin at this point is off the chart, eagerly awaiting the red light to come on, then to go out again as the race starts. Most of the team had a good race, with battles for places happening throughout the field, myself gaining 5 places. But unfortunately, Lewis Roberts crashed out early on, followed by Max Wilmot in the final laps of the race, the damage was only to the bikes, and Lewis would be back out that afternoon, but sadly for Max his bike needed spares we couldn’t obtain, so his racing for the day was done. For what seemed like the shortest lunch break on record, we were then thrust in to the CB500 race. The teams were Royal Navy 1 (myself, Max Wilmot, Charlie White) Royal Navy 2 (Jon Hunt, Johnny Atkinson, Callum Scott) and Royal Navy 3 (Stuart Goodson, Brian Fuidge, Alan Curtis). After a quick warm up lap we lined up along the track for the Le mans race start. 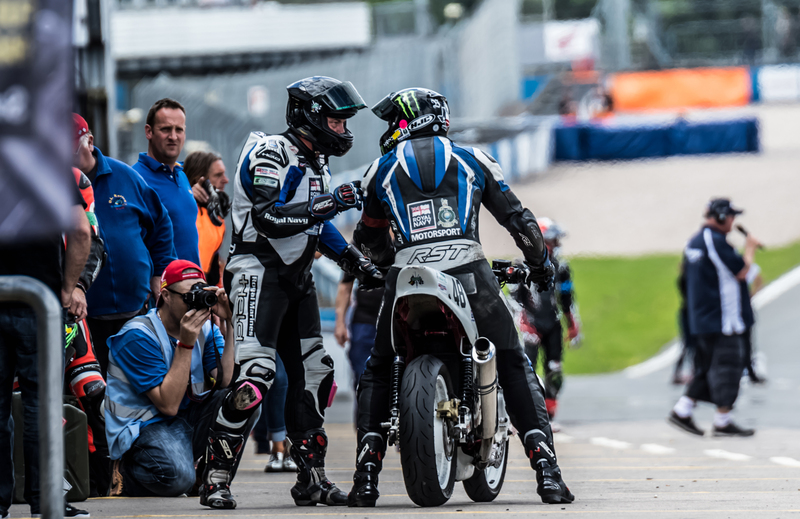 Here rider 2 held the bike by the tail only, at one side of the track in your qualifying place, engine turned off, where rider 1 stood opposite on the other side of the track waiting for the flag to drop, how race starts use to be conducted. Once the flag dropped Charlie White sprinted across the track in full leathers, took control of the CB500, fired her into life and took off to a good start, gaining a couple of places from the start. It was an awesome race start to see as many did, but to be a part of it was a whole other level and a once in a life time chance for many including myself. I now had 30minutes before it was my turn on track, it was now a game of watching the progress from the TV we had on live feed and from the pit boards the army had not only kindly lent to us, but were also helping us run as they had no CB500 teams on track. The time came as lads on the pit wall said “he’s in next lap” and we shortly saw Charlie at the beginning of the pit straight, he got us to a good start and our place was now in the low 30s, so it was now my turn to keep it, having minimal practise and experience on the 49 horse powered steed, corner speed was everything, we swapped over relatively smoothly and I was off. The first couple of laps I was getting to grips with the bike, i hit the revv limiter a couple of times, as the process of which gear to be in around the different corners run its course. Even as I improved and was starting to hit sub 1.30 minute laps consistently, the speed and skill of some of the other riders was very evident, and as some of them passed I did my best to latch on and keep them in sight for as long as possible, but steadily I was making at least some overtakes, so I was happy with that, and by the time I came in we were 30th, Royal Navy team 2 and Team 3 doing really well by this point and were in the mid 20’s. When I came in we conducted a refuel, so the bike had to be turned off, on the rear paddock stand and nobody else but those refuelling were allowed to touch the bike until refuelling was complete, or we risk a penalty, but we could still visually check the bike was holding up ok, which to be fair she was holding up nicely after the initial teething problems. Max was then let loose with the refuel complete, as he settled in the times came down as we picked at our opposition, and gradually made our way up the grid. Before we knew it, it was Charlie’s turn to get back out there on track, 1 hour 30minutes about half way through the race, we were gaining on team 2 and team 3 were pulling away into the low 20s. 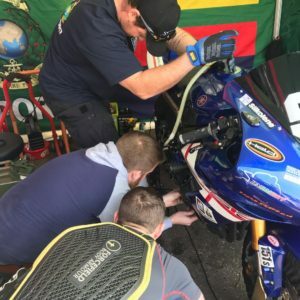 The change-over went smoothly and Charlie made some good consistent progress and by the end of his stint there was hardly anything between our team 1 and team 2, meaning we really needed to have a quick change and get back out here as they changed riders and refuelled. It was now also my turn to get out there in the hot seat, keep the pace up and improve the lead we had, I also now had got to grips with the bike and how it ran, fast and smooth through the corners was the key, knee and toed sliders were always on the deck in the corners. At one point i got down to 25th, then a few laps before I came in, that went back to 26th, but over a lap ahead of team 2, so all we needed was fuel to see us through to the end as we sent Max back out for the final run of 30minutes. Team 2 however had put their fastest and most experienced CB500 rider on Jon hunt, so this was going to be a close finish between our 2 teams. Max was doing well to keep our pace consistent and hitting 1.27’s but Jon was quietly gaining, hitting a 1.25 or 2 along the way, but would it be enough to catch us in the final minutes. As the final laps closed in, it became clear the places wouldn’t change and Jon’s ebbing at our lead wouldn’t affect the end result. By the end, 3hours after we started the race was over, the results being team 3 finished in an awesome 21st, completing 117 laps, Team 1 in 26th with 114 laps and team 2 in 27th with 113 laps. But in no surprise to any of us Ron Haslam’s team came 1st racking up 127 laps, but considering he runs his race school from Donnington Park I should hope he would. As if this wasn’t enough for one day, we still had 2 military interservice races to compete in back on our own bikes, and in need to score some point against the Army and RAF. But adrenaline was still high, so we were yet to feel the effect of this full day of racing. Once back on the grid an hour later, getting a good start was important, fighting to get up with the faster riders and latch on to them into and through the corners was the plan. The plan kind of worked but by the end of the 2nd military I could feel the strain of the day, although still cutting some good times. Alan Curtis and Lewis Roberts however found their feet again after the morning’s crashes, both started at the back of the grid, Alan getting into the low teens and Lewis in the middle of the top 10, setting them up nicely for the final race of the day in the mega laps, your grid position being determined from your previous race. At 1755 the final race of an action packed day was on circuit, with morale, adrenaline and the usual banter as high as ever. The red lights went out, and the last race was off, with an average start this race, I didn’t gain many places but had some good battling with one the army bikes and another of our lads Dan Greenwood, no matter how tired you might feel or think you are, when a bike comes past you, the strength to have a good battle for that place soon reappears. 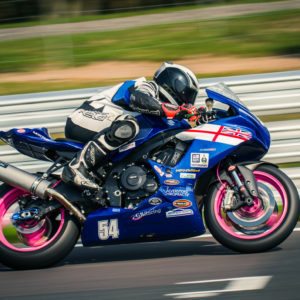 However Lewis Roberts with a better starting place on the grid, managed to get a podium finish in 3rd, the first time he’s managed to get to the podium on his R6, making his day, but also taking some points off the RAF, who had been dominating the top spots. Once again it came to that time, to pack all the kit away amidst the paddock area exodus. What a day though, drained faces were now everywhere as the adrenalin keeping most of us going wore off, but the moment we all chatted reflected back on the hectic days events, smiles would emerge of the fond memories made. I can’t think of better way to spend a Sunny summers Sunday.